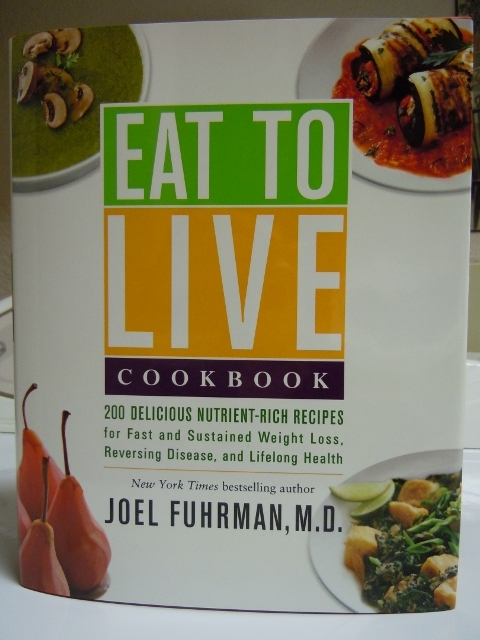 I pre-ordered Dr Fuhrman’s newest Eat To Live cookbook from Amazon and it has arrived! There are 200 recipes and even a small section of 6 recipes that contain a small amount of animal products. Dr Fuhrman recommends that no more than 10% of your calories come from animal products, thus 194 of the recipes are whole food plant based recipes. You don’t need to be following a whole foods plant based diet to benefit from this cookbook. If you are interested in eating healthy and want to include a few plant based dishes in you menu plan, this cookbook will be beneficial! I was so happy to see that all of the recipes include the standard nutritional information as well as the Beta-Carotene, Vit C, Calcium, Iron, Folate, Magnesium, Zinc and Selenium so you can see just how healthy your food intake really is. If you are a calorie counter or need to know how much cholesterol, sodium or sugar you are taking in -it’s all here for you. I read that this cookbook is available at Costco right now, book stores and of course Amazon. Cookbooks should have photographs and this one includes mouth watering photographs of many (not all) recipes. That eggplant dish on the left is going to be made in the days ahead! Yes it does include a little non dairy cheese on top – yum. There is even a menu planner for pairing recipes for everyday or entertaining on special occasions and holidays. The recipes are from a variety of sources including professional chefs as well as Dr Fuhrman’s daughter Talia. The Eat To Live cookbook does contain some of the favorite tried and true recipes from previous Dr. Fuhrman cookbooks and his website so I have already tried several of the recipes but the book does contain mostly new recipes. I have already gone through and bookmarked many new ones to try. Quick Banana Berry Breakfast To Go pg 65 – easy and satisfying. Golden Austrian Cauliflower Cream Soup pg 157 but I reduce the cashews to 1/2 cup – we love this soup – it freezes well. Dr Fuhrmans Famous Anti Cancer Soup pg 154 – hate the name but love the soup – have made it several times – freezes well. Goji Chili Stew pg 177 – unusual but really tasty. Better Burgers pg 250 – a little delicate but very low calorie – freeze and reheat nicely. Lentil Loaf pg 204 – I use frozen artichokes to keep it simple – love this. Oat Bars pg 284 – add the optional spices and you have a real treat to go with a cup of hot tea. Banana Walnut Ice Cream pg 300 – amazing – you won’t miss the dairy. Fudgy Black Bean Brownies pg 283 – not like a standard brownie but very satisfying when you just want some chocolate. Healthy Chocolate Cake with a Chocolate Nut Icing – OMG! This was amazing – more fudgy than cakey- we devoured it. In all fairness some of the recipes I tried when we first decided to go plant based that didn’t appeal to us should be tried again as our tastes buds have changed and adapted to little – or no – salt, oil and sugar. Plus I have a better handle of how to make things vegan and have them taste good. I should let you know that the following recipes did get high marks and good reviews on the Fuhrman message board. We didn’t like the following recipes the first time around but I might try them again to see if it was just because we were used to our old way of eating. Sunny Bean Burgers pg 249 came out dry and crumbly-one of my first attempts at making bean burgers. I tossed them. Asian Vegetable Stir Fry pg 182 way too many veggies I couldn’t fit it all in my pan – not enough sauce – didn’t eat the leftovers. Thai Vegetable Curry pg 181 too heavy on the tofu and it became a soupy mess – we tossed the leftovers. Maybe I needed to press the tofu before cooking it – I didn’t know that back then. A few of the recipes call for some products that Dr Furhmans sells on his website but they are not necessary to make the recipes – you can use any salt free seasonings in place of his- such as Mrs. Dash, Kirkland Salt Free Seasoning or Trader Joe’s 21 Seasoning Blend. Some of the recipes call for flavored vinegar’s which are available everywhere these days – Whole Foods carries a wide variety, health food stores, Amazon and the regular grocery store. Wendy over at Healthy Girls Kitchen is going to be cooking her way through the entire collection of recipes in the Eat To Live cookbook and she is inviting anyone who is interested in doing the same to join her. She will be choosing recipes each week to try and posting her review along with her recipe tips, tricks and tweaks! If you have made the same recipes you can chime in and give your review as well. 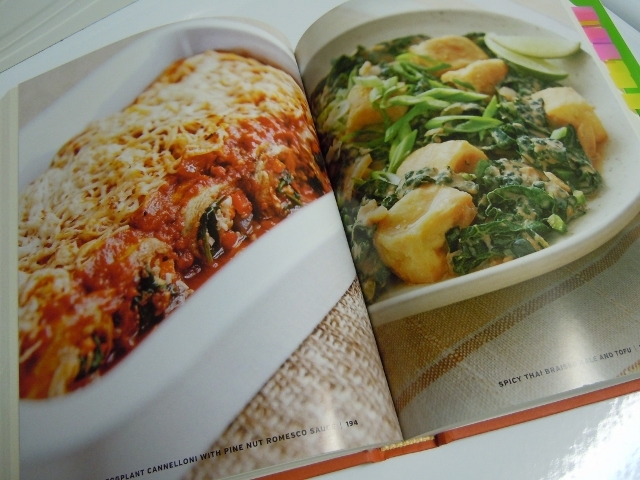 Check out Wendy’s Post Today to see what recipes she has selected for the first week of her cookbook project. I will be playing along and trying the recipes too. We all know how difficult eating healthy can be during the holiday season. I think Wendy’s project sounds like fun and a great way to keep up the motivation to try new recipes and maintain my healthy eating plan through the holidays. It comes down to choices. We can choose to navigate the holiday eating frenzy and still lose weight or maintain our weight. The alternative is to throw caution to the wind and end up several pounds heavier come January 1st! Last year with my foot surgery in December and being laid up for months the pounds came back on and I have worked ever so hard to lose that weight and regain my strength and fitness level. There is no way I am going to enter January with a weight gain! I am still hovering 4-5 pounds over my goal weight and would love to be at my goal weight come the new year. I can do it! There is that old saying “Fail to plan, plan to fail“. That certainly rings true for me. My plan for the up coming holidays is to continue eating a healthy, high nutrition, whole foods plant based diet with a couple well chosen, thought out, planned desserts that fit into this way of eating. It’s really pretty easy to do once I set my mind to it. What does our plant based Thanksgiving and Christmas dinner look like ? I have a few things in mind already and have tested a few recipes that will be on the menu – recipes and reviews will be coming up soon! Add your thoughts, comments or questions. Do you have a plan for getting through this season of holiday eating? Thanks for your review of Eat to Live. It’s a great reference and cookbook on our shelf. Mary you are so lucky to be able to hear Dr Fuhrman speak. I hope you will come back and let me know how it was and the most important things you learn! You are indeed having lunch with one of the big guys! Oh, lovely photos! That’s what most attracts me to a cookbook. I like lots of photos. That fudgy chocolate cake sounds incredible. I love cookbooks with lots of photos too Veronica! I love to see what a recipe is supposed to look like and then see how close my version is to the photo! I am very interested in getting this cookbook Tami. I am going to look for it at costco next trip. I love Wendy’s experiment. What a great idea! Renee I would love it if you joined in with cooking from this cookbook. I think it’s going to be fun. I made my first two recipes from it last night and they were yummy! Thanks for the wonderful review, I’ve heard about this cookbook from other blogs. I like cookbooks with mouthwatering photographs and thanks for the notes about the recipes you’ve made so far – I am interested in the Golden Austrian Cauliflower Cream, Dr. Fuhrmans Famous Anti-Cancer Soup, and the Fudgy Black Bean Brownies! And sorry to hear about the Thai Vegetable Curry – have you tried Tofu Xpress – I don’t like my curries too watery either. I’m looking forward to spending Thanksgiving in Oregon. I get home in November. Oh yes, he had been on Dr OZ quite a few times. They know each other and Dr Oz sends his heart patients that need to lose weight to Dr Fuhrman. I do indeed know how easy it is to gain weight at our age and how difficult it is to lose it now too! I do have the E2 and Forks Over Knives cookbooks – love the recipes and this way of eating! I love when cookbooks have all the nutritional information – it’s actually the tipping point of me buying an actual book! Sounds like a great cookbook. I read Super Immunity by Dr. Fuhrman’s and think he makes very good points. We still eat more than 10% animal products, but vegetables are certainly the star of every meal. I plan on eating the way I always I eat during the holidays. Since this will be my first holiday season without gluten and eggs (I found out I was sensitive to them in January), it will be maybe a little easier than normally since most holiday treats aren’t an option. For Thanksgiving, I want to make many wonderful vegetable dishes and a high quality chicken. None of us really like turkey, and it’s just too much meat.